A LOCAL charity pushed the boat out last Thursday when a remarkably sprightly resident celebrated her 106th birthday. Kay Hurley’s incredible milestone was marked with a special afternoon trip on Surrey Care Trust’s boat Swingbridge. Fellow residents and staff from Woking’s Bernard Sunley care home – which is run by the national charity Friends of the Elderly – enjoyed a delicious picnic with a birthday cake made by the home’s chef – all washed down with some celebratory bubbly. Born in County Carlow in southern Ireland and christened Catherine, Kay moved to England at the age of 21. She married a military policeman and went to live in Austria for a while when he was stationed there. The couple had two daughters, Becky and Marie, and Kay now has three grandchildren and five great-grandchildren. She has always had an active mind and loves playing bingo, cards and dominos – which she still plays today with her fellow residents. 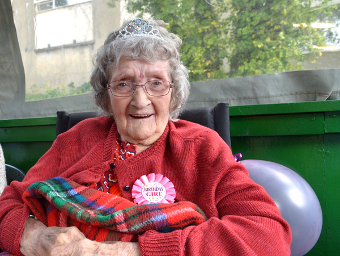 Kay is also well known in the care home for being someone who enjoys having her hair and nails done regularly and for her love of statement jewellery, hence the tiara. Always a keen cook, she is famous among her family and friends for making Victoria sponge cakes and roast dinners. Manager at Bernard Sunley, Julia Christodoulides, explained: “Kay has lived with us for three years now. She is well liked so we had a brilliant time celebrating her 106th birthday. Kay received a card from the Queen and a medal from the President of Ireland to mark the occasion. THE national charity Friends of the Elderly provide support for all older people, particularly those in need due to mental or physical frailty, isolation or poverty. Support services include care homes, befriending schemes and grants. Volunteering opportunities are available on an individual and staff programme basis. For more details go to www.fote.org.uk.